This afternoon I received a tour from the Spa Utopia in Downtown Vancouver. My last Spa visit was a brief tour I took early last year when I first joined the Hotel. Since then, the Spa has seen a huge face lift with a new hair salon, improved treatment rooms and a beautiful front lobby. 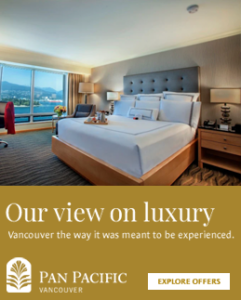 Located underneath the Pan Pacific Vancouver, Spa Utopia is 11,400 square feet of pure luxury. Whether its the beautiful bathrobes, luxury ammenities or the relaxing ambiance, it’s the perfect getaway. As soon as you make your way past the lobby, you feel like you’ve just entered an ancient Greek or Roman bath. The staff is curteous and friendly and always respects the privacy of its guests. Spa Utopia is the largest employeer of Registered Massage Therapists in British Colombia, with 55 RMT’s in its three locations. Regardless of your condition or your specific needs, the RMT’s will make sure you receving the proper treatments. In addition to their professional staff, did you know the Spa also ensures they have the latest equipment and treatment therapies as well? 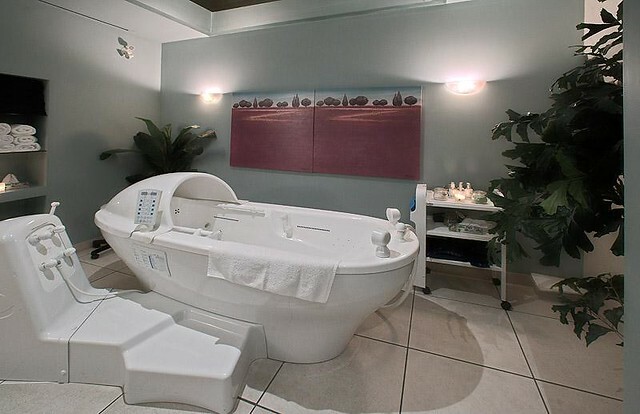 They are one of the few facilities that specializes in Hydrotherapy Bath Treatments. The European hydro-tub is equipped with anatomically positioned air and water jets; 8 programmed sessions from which to choose; and an underwater, handheld massage wand. What also make this facility unique is the various couples, group and VIP rooms to choose from. You can even order tapas, lunch or dinner off the menu, served fresh from the Cafe Pacifica Restaurant. The Spa is a great place for both women and men to relax and is open 7 days a week; so be sure to pay them a visit the next time your looking for a little R&R. And don’t forget, as the weather starts improve, you can use the Pan Pacific’s outdoor heated pool and jacuzzi FREE when you book any treatment from the Spa. Looking for an easy and FREE way to spend the afternoon at Spa Utopia? This is it! Contest ends March 4, 2011. But it sounds like the most blissful “day off” every. I do not normally enjoy going to the spa, but Spa Utopia is one spa I love going to. They treat you like a king (or queen for the ladies)! I have NEVER had a spa day nor a professional massage in my life. I work like hell and NEED this! Fingers crossed.. The best spa treatment in Vancouver! Love the steam room, relaxation lounge and had the most relaxing, informative and technical facial here. Absolute luxury at Spa Utopia. I love Spa Utopia because it really lives up to its name! I actually love their school! Downtown, across the street from Tinseltown, they have a school, offering deep discounts on student services such as mud wraps, Vichy shower and hydrotherapy tub services. Amazing deals! I would love to try it out, it’s a beautiful facility! Wow – how could I not love Spa Utopia? You actually feel so removed from it all in the tranquil lounge…. you could be anywhere in the world in this haven, without the cares of the world – be it work, family or just day-to-day life – and be indulged and pampered by some of the best in the business. It’s the small touches, like the orchids by your drink, that take it up a level. I love the relaxing atmosphere, the attentive staff and the pedicures :0)…I got ready on my wedding day there and it was AMAZING!!!! The body wraps are amazing!!!!!!! What I love about spa utopia…? Well, I’ve never been there but I know I WOULD love it! I need to win this! I love spa utopia! I could spend a full day there just relaxing in the eucalyptus steam room and then to finish that off with a full body massage! Heaven! Nothing would make me happier than to have another one… please? Thanks! Spa Utopia is the only spa I go to. They have fabulous service and awesome employees. They have always treated me wonderfully. I really do think they are the best spa around!! I love Spa Utopia because they have RMTs in an amazing spa setting! For a 50 min. massage I can feel pampered for 2+ hours while hitting the sauna, steam room, and a nice shower etc. I have been to Spa Utopia, in Langley, 3 times in the last 2 years, I absolutely love it! My Certified Massage Therapist treats me so special, she knows exactly what muscles need the most work and the surroundings are so peaceful. I work very hard everyday, very physical work and my muscles hurt! Spa Utopia is the place to relax, enjoy some quiet, peaceful time, and get totally pampered. I haven’t had a holiday in many years and this is sort of my ‘pretend’ holiday (for an hour). I would love to win a Relaxation Spa Package/Room with a view, (never stayed at a Hotel either, so, that would really top it off! I had my first spa experience about 6 yrs ago. I’ve been twice since then, to two different spas. It was amazing! However, I have not been to Spa Eutopia…YET!! I’ve been under a TON of stress….ongoing for the past several years. And it seems like this is the way of my life these days, with more and more issues being added to my plate. A spa day would be entirely appreciated and very much needed! I love Spa Utopia!! I’ve only been there twice but those times I went I felt like royalty. It really does feel like a vacation in your backyard. I love this Spa, its absolutely devine. On that note I have never actually had any services done there. My old roomate used to work there and she gave me a tour once….im sure i drooled for the whole tour. Its gorgeous!! just simply gorgeous! Spa Utopia is simply the best! I have only been to the Langley location, but their services are awesome and their staff is incredibly professional. I would love the chance to try out the Vancouver location! I have never been to the spa, however I love spa days and everyone that I know that has had a treatment there loves it. My daughter would love to attend school there one day. A spa day for the two of us might convince her to get her training. Spa Utopia is the best in town. When you want to reward yourself or give a very special present, this is a great option that you will never forget and will always want to go back for another moment to feel renewed. My favourite thing at the Spa Utopia is the Eucalyptus Steam Room. After a heavenly massage is there is no way better to further relax then taking deep breaths in the steam shower. I love the way it makes me feel relaxed, centered, and ready to take on what ever tasks I have going on in my busy life! I have never been to a spa, would absolutely love to go and take my husband with! What a fabulous day that would be together!!! It looks like a very nice facility. Excellent way to relieve stress! I always say “Forget Disneyland, Spa Utopia is the Happiest Place on Earth!” My fave place by far. I love Spa Utopia because they pamper you! Instead of being home looking after two babies and a husband, i get a luxurious facial and a stress free couple hours! Love Spa Utopia! I have never been to Spa Utopia, But I would love to win to tell you how much I love it!!! I had my son 5 months ago and a nice relaxing “getaway” would be sooo perfect right now!!! I’ve had the pleasure of experiencing a massage at the Spa Utopia in N Van, for my birthday. It is truly first-class service! I would love to win an entire spa package – heavenly!! I have never had the pleasure of visiting Spa Utopia, but it looks and sounds like an ideal place to relax, unwind, and let the stresses of life pass you by! As a single mom of 2 toddlers and a student, I don’t often get time for myself … I have never been to a spa but have always wanted to go, so I can’t honestly tell you what I like best about Spa Utopia, but if I ever get to go, I am sure I will have nothing but good things to say. This looks like a piece of paradise! I’ve never been but I’m sure if I ever got a chance to try it I’d be hooked! I love spa utopia – they treat you like royalty, and even though I rarely get to go (I have three young kids), when I do I feel SO relaxed and re-charged when I am done. I’ve never been to Spa Utopia before, but always wanted to try it, since my friend always talks about how amazing the massage is there! I haven’t been to Spa Utopia in AGES and would love to go back!! One of my favorite features that makes it stand out is the eucalyptus steam room. I love Spa Utopia because winter is the best time for a spa visit!!! I would love to spend a day with my mom at the Spa Utopia. She’s had a really difficult year and she could sure use a day of pampering! I love Spa Utopia! Because their facials are amazing, and relaxing in the lounge before and after a treatment is so fantastic. I love Spa Utopia because it is beautiful and relaxing!! I have never been to Spa Utopia…what an introduction!!! I would so love to win this Never never have i had a treatment like this.. well in small doses a couple of times but oh wow.. I would love this.. I love Spa Utopia because it makes me feel so amazing after a treatment or two. It’s even more fun to go with a girlfriend, and especially wonderful with a significant other! It’s a great thing to do to get away from it all without going far! I absolutely love Spa Utopia! I have been going there for years and love the relaxing atmosphere and the wonderful treatments they provide. Everytime i wait for the elevator…the smell of Spa Utopia ROX! Love Spa Utopia! Excellent clean facilities, friendly service. It’s the best! I love spa utopia’s environment and how the staff makes you feel when you visit. I am in need of some serious relaxation time at Spa Utopia. I have been a twive before and the treatments and experience is always next to none. Never been to Spa Utopia, but I love it already from the description! When I think of a perfect day of pampering and relaxation is has to be Spa Utopia! The professionalism and care taken to make each visit remarkable are second to none. The Spa Utopia Salon is fabulous as well!!! I’ve been going to Spa Utopia in Langley and I can attest to the getaway aspect of it all! I’m in love with their steam room and relaxation lounge, which are huge bonuses for me–plus the staff don’t rush you out the door (I hate pushy people!). Any day and any place where people are pampering me – well, that is there not to like? Although I’ve never been to your spa, I have been to your restaurant many times so can only assume that the same level of service exists in the spa. I haven’t been yet but looks so amazing!!! Spa Utopia makes my wife happy. Need I say More? I love Spa Utopia because it is so relaxing. It all sounds so lovely. I have never been to Spa Utopia and would love to experience it like all the other people commenting have. I love Spa Utopia because of it’s tranquil atmosphere. You truly feel very pampered when experiencing their services. I love Spa Utopia!! I always look forward to my next spa appointment. Never been to Spa Utopia but I’ve heard tons of good things about it! Would absolutely love to try it… especially with my final projects coming up!! I haven’t been to spa utopia but have heard nothing but good things about them! The staff is always very professional and the cleanliness is top-notch! Spa Utopia is like entering into the enticing gardens of some foreign Eden. To be luxuriously pampered by gentle and skilled hands, is akin to being basked in a blissful slumber, only to awake as an increasingly rejuvenated soul, and feel a youthful goddess. That is why I love the spa! Love the spa staff-very professional. Sooo relaxing after a stressful day. Stylist a the salon are top notch ! I love the Spa Utopia because of their local schools training the best staff! i love the spa! it’s so relaxing! Hope i win! I have only been to the Langley location of Spa Utopia and it was the best gift I have ever received.I would love to win a chance to visit the Vancouver location for a massage….pure luxury. I love Spa Utopia … so relaxing and I am so pampered. Spa utopia is rad , awesome and narly, dude. It is tight , fly and off the chain. 2 fingers snap. I love how professional the staffs are. Pick me, your next winner! Starving artist here desperately needs the relaxation package to unwind and unstress. Spa Utopia is the staycation getaway we dream of. Serenity and luxery. I’ve been to Spa Utopia once before as a special treat…to me. It was my favourite spa experience, hands down. I love Spa Utopia because of the great staff who know how to give a great massage! received a massage at spa utopia as a bday gift from my friend and WOW! I have never felt so pampered! an unforgettable experience. I’ve always wanted to go to Spa Utopia because I’ve heard so many great things about it! I love Spa Utopia for the professional staff and the lovely relaxation lounge, which is almost as therapeutic as the treatments themselves. I always look forward to leafing through magazines while nibbling on healthy snacks and your yummy signature rooibos cocktail while feeling relaxed and gooey from a nice pedicure or massage. I always leave feeling perfectly pampered, refreshed and de-stressed! . I want to spend the day at Spa Utopia!!!!! Spa Utopia looks so relaxing, clean, beautiful decor. looks like an amazing vacation spot! I love Spa Utopia because it is a total mind-body experience. The atmostphere is calm and serene, the surroundings are beautiful and the servie is beyond compare. Not to mention all the extra little services that are free with your treatment, like the glass of wine, the steam rooms in the change rooms, the outdoor pool, the makeup application. I love Spa Utopia for its highly trained staff, and clean, inviting atmosphere. Everybody loves Spa Utopia because of their stellar customer service, their upscale yet relaxing facilities, their unrivaled professionalism and so much more from big to small details. How could you not love a place that makes you feel like you’ve shed a few years everytime you walk in, and then another few once you walk out! Spa Utopia is the ultimate spa experience! From the moment you walk in the door you are made to feel that it is all about you and your relaxation. You are encouraged to stay as long as you would like, they provide every ammenity you need and offer free services as well. You are never pressured to purchase their products, and staff is on hand to discretely see to your every need. A visit to Spa Utopia is the highlight of every trip I make to Vancouver, and I talk it up to all my friends. Had a few experiences at spa utopia and they were all a inning experience. Can’t wait to return. I need this so badly! A day @SpaUtopia – would equal perfection! Brought my bestfriend and my sister to Spa Utopia to have specialized treatment and girl time! Always greeted with professional spa personnel! My favorite spa place to date! I have always loved spa utopia treatments and their great customer service! It`s the best spa in B.C.! Must I say more!!! I have been a spa utopia patron for over 5 years and couldn’t dream of going anywhere else. I started going after receiving a gift card from some friends. I love the deep tissue massages and have found no other spa that compares in relieving the tensions in my back caused from years of sports and now from my current career of classroom teacher. My favourite thing about Spa utopia is that it has become my sanctuary. I escape the world even if its only for a quick trip in to see my wonderful esthetician, Kim. No other spa has ever made me feel like I have left Vancouver and escaped to a hidden place to rejuvenate. Everytime that I have been to Spa Utopia I feel so rejuvenated and beautiful. My boyfriend knows that the only gifts that I truly appreciate is a spa at treatment with you because he knows my self-esteem and confidence is always boosted after each visit. I also love how they treat their customer with the best attentive care, this is why I trust them when I buy packages for my girlfriends. Thank you everyone for participating and submitting your kind comments about the Spa Utopia Vancouver! Congratulations Sepideh!! Your comment was chosen as the lucky prize winner! You will receive $100 Gift Card to the Spa, Lunch for 2 from the Cafe Pacifica Restaurant and free Valet Parking! Please check your e-mail for all the details. Thanks everyone and be sure to ‘Like’ us on Facebook and Twitter to hear about this month’s upcoming contest! My visit to Spa Utopia had me so relaxed i felt I was walking on air. I am training for my first half marathon and a day off at the spa is all I need to energize and recharge!! Good Luck!! I’ve only been able to dream about a day at the spa. This would be a dream come true. It would be “Happy Mother’s Day to me!” LOL! I love Spa Utopia – while looking at the pictures I was awash with calm happy relaxed feelings almost as good as the real thing! I have been a loyal patron at Langley’s Spa Utopia for at least 5 years. I love the spa atmosphere cultivated, frequenting the establishment for atmosphere and the well trained, respectful staff. It is here that I arrange indulgent events with friends and family, as I am always assured this will be a most pleasant and carefree result. I LOVE Spa Utopia because they take such great care of you. It’s a relaxing, gorgeous environment that emulates peace and tranquility. Feel like a new person when I walk out after a treatment. I love the Spa Utopia because the the serene atmosphere and quality of service. Spa Utopia is first class from start to finish. I wouldn’t think of going elsewhere. Thank you for your fantastic staff in taking such good care of all of us. I appreciate spa utopia for what it does for my wife. Ever since spa utopia has opened, for special occassions I have bought surprise spa packages for my wife. She is always so relaxed and happy after her treatments and always says she loves going to Spa Utopia and it is her favourite place to go as it is not only about the treatment, it is truly an experience. She loves what the spa offers including the orchids left after each treatment, wine, fresh fruit and dried nuts, steam bath and the decor of teh facility. Truly high class all the way and service with care and a smile. Thank you Spa Utopia! I would love to send my mom to the spa! My mom loves to go to Spa Utopia but she doesn’t often get there. She especially loves the eucalyptus steam room prior to her treatment. She is 90 years old this week and is in amazing shape! 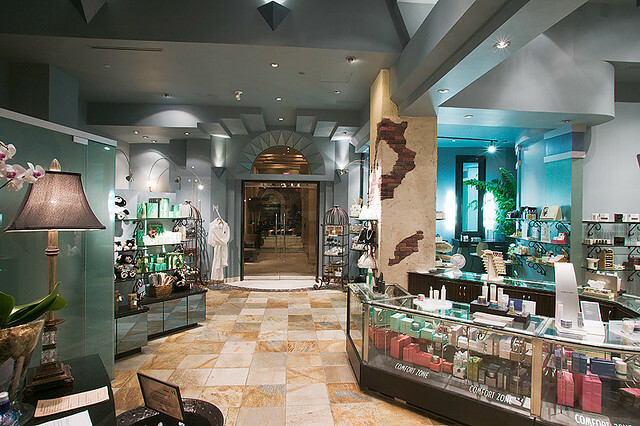 I appreciate the service at Spa Utopia – I feel comfortable sending my mom there on her own.